These are posts that stay on the front page as well as their regular category. Like a sticky post. 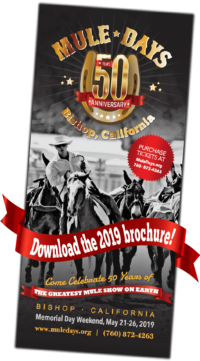 Caltrans would like to remind the public of their goal to provide safe pedestrian access on downtown sidewalks the week of Bishop Mule Days. 2017 is going to be a year of “steady as she goes”, says Show Chairman Tom Hardy. Bishop Mule Days offers many lodging options to accommodate customers' needs.